Combining robust exterior styling with refined interior craftsmanship and a spacious cabin, the new RAV4 is built for the city and beyond. Its engaging driving position and all-round visibility put you in complete control. And with a powerful new 2.5 litre Hybrid Dynamic Force engine, it delivers the performance you need, whatever the road's condition. 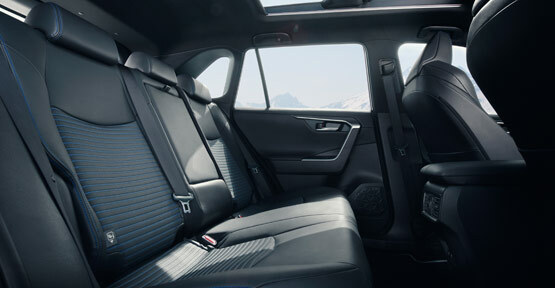 RAV4’s technology is thoughtfully applied ensuring your journeys instantly become easier and more enjoyable. The ingenious new digital rear-view mirror can be activated at the touch of a button, turning the electrochromatic, auto-dimming mirror into a high-definition digital monitor. Using a camera mounted high on the vehicle’s rear windscreen, it gives you an uninterrupted view of your surroundings, even if the boot is piled high with luggage. Parking and manoeuvring at low speeds have never been easier, thanks to a wealth of digital features such as the Intelligent front & rear parking sensors with automatic braking which enables you to navigate tight parking spaces when your visibility is limited, by giving you audio warnings as your RAV4 gets closer to obstacles. 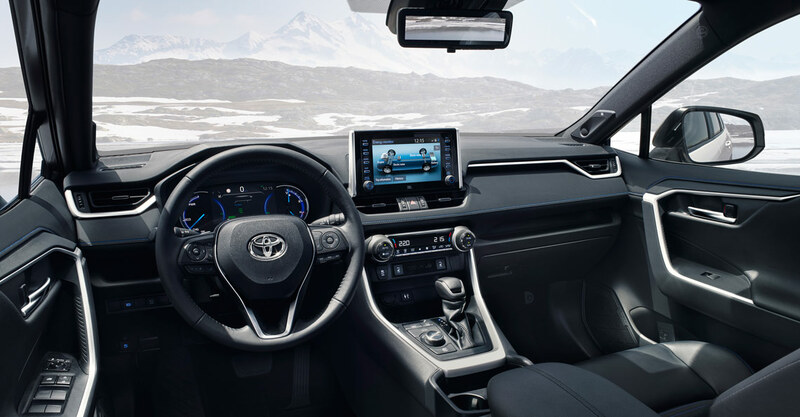 Or the useful Panoramic View Monitor (PVM) uses cameras positioned all around the RAV4 to create a 360º 3D view of your surroundings, which it displays clearly on the Toyota Touch® 2 multimedia system screen. The driver can even choose from two viewing modes: Moving View and See-through View at the touch of a button on the screen, so you’ll never be surprised by any hidden obstacles. With environmental issues leading to even stricter anti-emissions regulations being instilled in large European cities, Toyota’s self-charging hybrid range is an attractive offering in eco-friendly, urban transport. The new Hybrid Dynamic Force powertrain, which makes its debut in the new RAV4, is a four-cylinder, 2.5-litre Hybrid petrol engine, focused on pure driving pleasure. Using both direct and indirect injection, it delivers ample torque at all speeds. 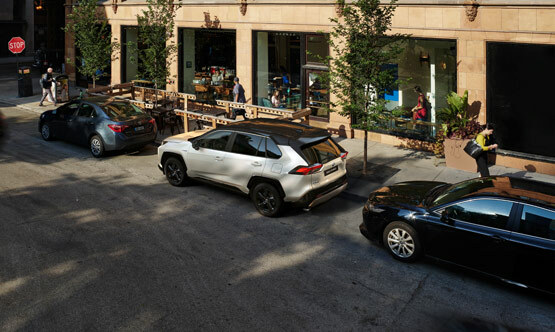 And thanks to to the introduction of RAV4's Hybrid AWD-i,you'll enjoy a more sure-footed performance, especially noticeable when pulling away on loose, slippery surfaces. Alongside these improvements, the maximum output for the Hybrid AWD-i and FWD systems have seen an increase, while RAV4's overall acceleration has improved too. This means a smoother, more linear pull-off from stationary and improved efficiency at higher speeds - meaning you have the power you need, exactly when you need it. The new RAV4 can drive anywhere and everywhere. From urban areas with emission restrictions to multi-lane highways and country roads in challenging conditions. And because of the 'power with no compromise’ philosophy, RAV4 delivers impressive performance, drivability, efficiency and vast improvements to drive technology. Toyota New Global Architecture (TNGA) marks a revolution in the way the company designs, engineers and manufactures vehicles, and is integral to the company’s mission to build ever better cars that are more stylish, more enjoyable to drive and even safer. The new TNGA platform underpins the “confident and natural” driving quality for the new model: “confident” in reacting favourably to disturbances while delivering a sense of stability, and “natural” in its intuitive response to the driver's inputs. The TNGA platform allowed Toyota's designers more freedom to achieve their mission: create the new RAV4 with a strong SUV character and styling that sets it apart from other models in its segment. And when you get inside, the refined interior is a delight to be in with all senses being taken into account. From the driver's perspective, the new TNGA chassis delivers a more engaging driving position together with better visibility and a more commanding view of the road - a defining quality of a pure SUV. Additionally, the upgraded Toyota Safety Sense package ensures extreme security for you, your passengers and your fellow road-users. This delivers an enjoyable with class-leading safety, from a product that is full of personality with an eye-catching design and refined interior comfort - setting a precedent for modern SUVs. The first ever better car is here; thanks to the new TNGA platform. 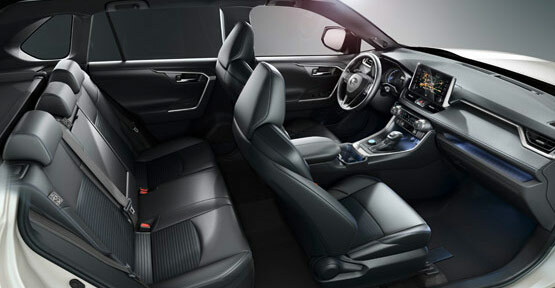 With an abundance of cleverly designed storage spaces, alongside versatile fold-flat seats, the spacious new RAV4 is as practical as it is stylish. And with optional features including a panoramic moon roof, even the longest journeys are a joy. Refined sensory quality and segment-leading standard technology come together in a thoughtfully designed space, where simplicity meets high technology in seamless style. The RAV4 Story In 1989, at the Tokyo Motor show, Toyota displayed a brand new concept car to the world and from that day the Recreational Active Vehicle with four-wheel drive was born.